The National Volksarmee 'National People's Army" was the national defense force of East Germany created on March 1, 1956, six months after the formation of the West German Bundeswehr, from the Kasernierte Volkspolizei (Barracked People's Police). It was preceded by years of preparation during which former Wehrmacht officers and Communist veterans of the Spanish Civil War helped organize and train paramilitary units of the Volkspolizei 'People's Police'. With its German appearance including uniforms and ceremonies patterned after older German military traditions, the doctrine and structure of the NVA were strongly influenced by the Soviet Armed Forces, thus mixing elements of the 20th century's most innovative and successful schools of military in a force which, for its size, was considered one of the most professional and prepared of the world. Former GDR Interior Minister Willi Stoph served as the first Minister of National Defense between 1956 and 1960. He was followed by Heinz Hoffmann, who was to serve in this capacity until his death in 1985. From its inception, the NVA became an army where professional officers were also expected to be SED (East German Communist Party) cadres. Political officers charged with instruction of the troops on ideological, military, and global affairs formed an essential part of NVA daily routine (Politische Hauptverwaltung/Political Main Administration). 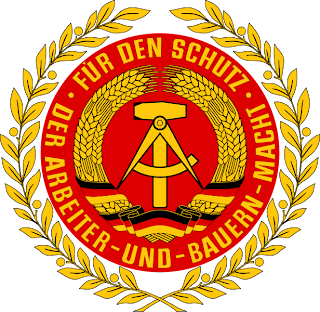 By definition, the East German army served “the Party and the People” (“Parteiarmee”), and almost every active officer was a member of the SED. NVA structures took on a repressive and vindictive character against those in uniform who dared to dissent on matters deemed “political”. During its first year, about 27 percent of the NVA's officer corps had formerly served in the Wehrmacht. Of the 82 highest command positions, 61 were held by ex-Wehrmacht officers. The military knowledge and combat experience of these veterans were indispensable in the NVA's early years, although by the 1960s most of these World War II veterans had been retired. The West German Bundeswehr similarly relied on Wehrmacht veterans who initially comprised the majority of its commissioned ranks. In its first six years, the NVA was an all-volunteer force. West Germany, in contrast, re-introduced universal military service in 1956. Conscription was finally introduced in 1962, and the NVA's strength was increased to approximately 170,000 troops. Like the Communist parties of other socialist states, the Socialist Unity Party of Germany, or SED, assured control by appointing loyal party members to top positions and organizing intensive political education for all ranks. The proportion of SED members in the officer corps rose steadily after the early 1960s, eventually reaching almost 95 percent of the officer corps. The NVA never took part in full-scale combat, although it participated in a support role in the suppression of the Prague Spring of 1968 and NVA officers often served as combat advisers in Africa. When the Soviet Union prepared to occupy Czechoslovakia, the GDR government originally planned to use the 7th Panzer Division and the 11th Motorized Infantry Division to support the intervention, but fear of international reaction to the deployment of German troops outside Germany for the first time since the Second World War caused second thoughts. Instead, the NVA provided logistical help when Soviet troops advanced into Czechoslovakia and stood at the border ready to intervene in the event that the Soviet Army could not quell the uprising. During the 1970s, and increasingly in the 1980s, the NVA achieved new standards of mobilization times and combat readiness (Gefechtsbereitschaft). NATO’s submarine-based missiles were seen as its most potent weapon and the hardest to defend against. Ultimately, 85 per cent of all NVA units were on constant alert and trained to depart within 25 to 30 minutes from their bases to designated areas about five to seven kilometers apart. Mobilization of reserves would have been completed within two days. These unprecedented levels of combat readiness were considered the major asset of GDR military deterrence. Needless to say, such preparedness levels placed a huge strain on military professionals and conscripts alike. In the early 1970s the NVA was assigned the wartime mission of capturing Berlin by the Group of Soviet Forces in Germany high command. The NVA plan for the operation was designated 'Operation Centre' and called for some 32,000 troops in two divisions, accompanied by the GSFG's 6th Guards Separate Motor Rifle Brigade. The plan was regularly updated until 1988, when a less ambitious plan that simply aimed at containing Berlin was substituted. In the autumn of 1981, the NVA stood ready to intervene in Poland in support of a possible Soviet invasion, but the declaration of martial law in Poland averted the crisis. The NVA was in a state of heightened combat readiness on several occasions, including the construction of the Berlin Wall in 1961, the Cuban Missile Crisis in 1962, the 1968 Warsaw Pact intervention in Czechoslovakia, and, for the last time, in the autumn of 1989 as protests swept through the country. The NVA was a professional volunteer army until 1962, when conscription was introduced. In 1987, at the peak of its power, the NVA numbered 175,300 troops. Approximately 50% of this number were career soldiers, while the others were short-term conscripts. The armed forces were controlled by the National Defense Council, but the mobile forces were under the Warsaw Pact Unified Command. Political control of the armed forces was through close integration with the Socialist Unity Party of Germany (SED), which vetted all the officers. Popular support for the military establishment was bolstered by military training provided by the school system and through the growing militarization of society. From a Leninist perspective, the NVA stood as a symbol of Soviet-East German solidarity and became the model Communist institution—ideological, hierarchical, and disciplined. The NVA synthesized Communist and Germanic symbolism, naming its officers' academy after Karl Marx's coauthor Friedrich Engels, and its highest medal after Prussian General Gerhard von Scharnhorst. At the critical moment in its history in November 1989, the NVA rallied to its Germanic heritage and rejected the SED, refusing to battle the demonstrators protesting the regime. Mikhail Gorbachev refused to let Soviet troops become engaged, and so, not just the leadership but the entire single party system in East Germany collapsed, and the country was soon absorbed into West Germany. The NVA was disbanded in 1990. 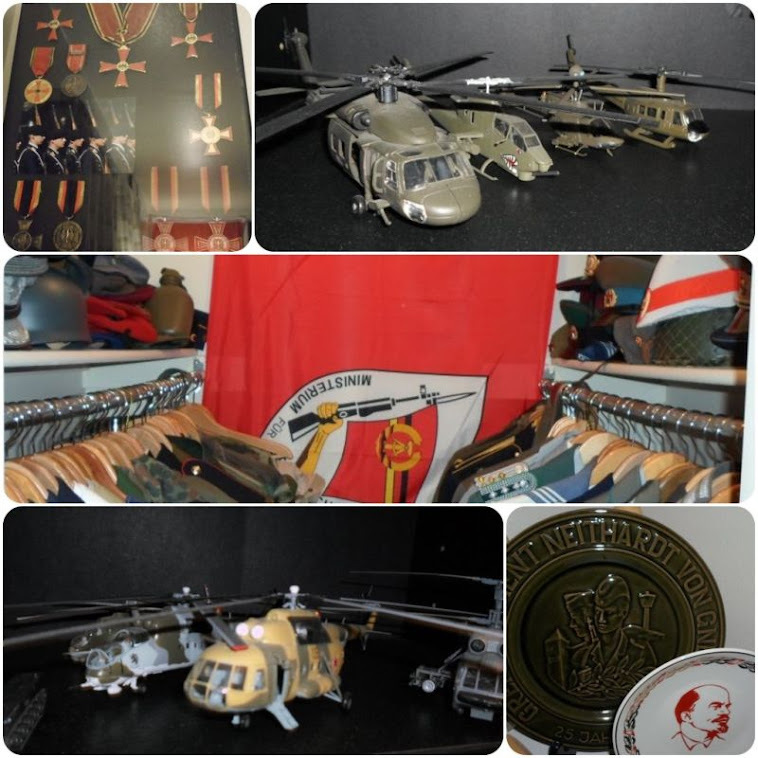 Its facilities and equipment were handed over to the Bundeswehr. Most facilities were closed, and equipment was either sold or given to other countries. Most of the NVA's 36,000 officers and NCOs were let go, including all officers above the rank of lieutenant colonel. Only 3,200 were retained by the Bundeswehr after a demotion of one rank. In addition, all female soldiers and all soldiers over the age of 55 were also discharged. Many former NVA officers feel bitter about their treatment after unification. While receiving only minimal pensions, few have been able to find jobs except as laborers or security guards. Former NVA officers are not permitted to append their NVA rank to their name as a professional title; no such prohibition applies to rank attained in the Wehrmacht or Waffen-SS during the Nazi era. The NVA was, in relation to its equipment and training, one of the strongest armies in the Warsaw Pact. It was outfitted with a large number of modern weapons systems, most of Soviet origin, from which a small portion were given back to the Soviet Union in 1990. The remaining equipment and materials was very substantial. Large quantities of replacement parts, medical supplies, atomic, biological and chemical warfare equipment, training devices and simulators, etc. had to be disposed of. One of the first measures taken after reunification was a survey and securing of weapons and devices by former members of the NVA. The federally operated Material Depot Service Gesellschaft (MDSG) was charged with taking custody of and warehousing this equipment. The MDSG employed 1,820 people who were primarily taken from the Bundeswehr. The MDSG was privatised in 1994. Unless the defense material was given free of charge to beneficiaries in the new federal states or other departments, to museums, or to friendly nations in the context of aid supplies in third world nations, it was destroyed. Before the construction of the Berlin Wall in 1961, military service in the GDR was voluntary, though the Free German Youth and public schools mounted intensive recruitment drives and service in the NVA was often a prerequisite for career advancement. Compulsory service had been introduced earlier in West Germany (1956) one year after the Federal Armed Forces were established; but the GDR held back from this step until 1962. The reason was partly that the authorities feared that conscription would swell the ranks of GDR citizens fleeing to the West. The situation changed when the border was sealed in August 1961, and five months later the government announced a mandatory service term of 18 months for men. There was, at first, no alternative service for conscientious objectors. This changed in 1964 when, under pressure from the national Protestant church, the GDR's National Defense Council authorized the formation of Baueinheiten (construction units) for men of draft age who "refuse military service with weapons on the grounds of religious viewpoints or for similar reasons". The construction soldiers wore uniforms and lived in barracks under military discipline, but were not required to bear arms and received no combat training. In theory, they were to be used only for civilian construction projects. The GDR therefore became the only Warsaw Pact country to provide a non-combat alternative for conscientious objectors. However, fearing that other soldiers would be contaminated by pacifist ideas, the government took care to segregate the construction units from regular conscripts. Moreover, conscripts who chose the alternative service option often faced discrimination later in life, including denial of opportunities for higher education. The Volksmarine (People's Navy) with a strength of 18,300. The Luftstreitkräfte/Luftverteidigung (Air Forces/Air Defence) with a strength of 58,000. The Grenztruppen der DDR (Border troops of the GDR), consisting of 50,000 border guards. In wartime, mobilization of the NVA's reserves would have nearly doubled its strength. 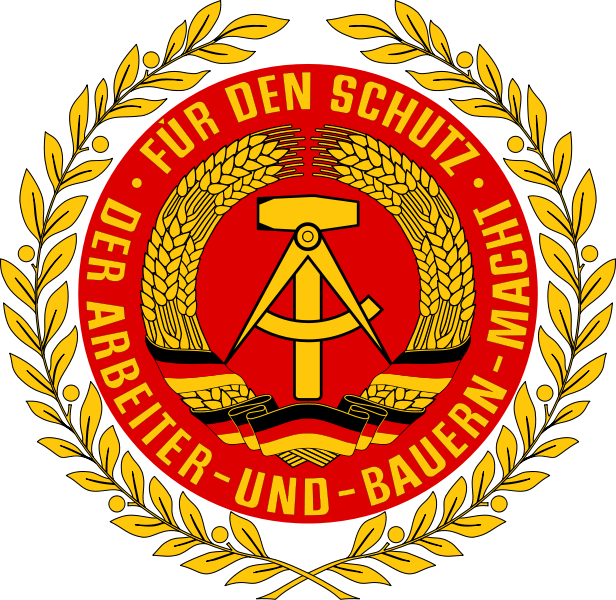 GDR authorities also had at their disposal the internal security troops of the Ministry of the Interior (the Kasernierte Volkspolizei or garrisoned People's Police) and the Ministry for State Security (the Felix Dzerzhinsky Guard Regiment) along with the 210,000 strong party auxiliary "Combat Groups of the Working Class" (Kampfgruppen der Arbeiterklasse), who were available in times of war. the Kommando Landstreitkräfte (KdoLaSK) based in Geltow near Potsdam. the Kommando Luftstreitkräfte und Luftverteidigungskräfte (KdoLSK/LV) based in Strausberg. the Kommando Volksmarine (KdoVM) based in Rostock. the Kommando der Grenztruppen (KdoGT) based in Pätz near Berlin. The first military units of the Central Training Administration (Hauptverwaltung Ausbildung — HVA) were dressed in police blue. With the restructuring of the Barracked Police (CIP) in 1952, khaki uniforms similar in shape and color to those of the Soviet Army were introduced. The desire for a separate "German" and "socialist" military tradition, and the consequent founding of the NVA in 1956, introduced new uniforms which strongly resembled those of the Wehrmacht. They were of a similar cut and made of stone gray cloth. The dark high-necked collar were later deleted, except on the coats from 1974-79. The peculiar "gumdrop" army helmet was based on a prototype "B / II" helmet, developed for the Wehrmacht by Prof. Dr.-Ing. Fry and his collaborator Dr. Hansel from the Institute for Defense Technical Materials Science in Berlin, which was in trials since 1943 but was not adopted at the time. With the exceptions of the People's Navy, whose dark-blue uniforms were consistent with the styles of most navies around the world, and the Combat Groups of the Working Class (Kampfgruppen der Arbeiterklasse), who wore their own olive-green fatigue uniforms, all NVA armed services, the Felix Dzerzhinsky Guards Regiment, the Border Troops of the German Democratic Republic, and the Barracked People's Police (Kasernierte Volkspolizei) wore the same basic uniform. Several later modifications were introduced, but the style and cut remain fundamentally the same. There were variety of uniforms worn according to setting (work or social) and season (summer or winter). Most uniforms (service, semidress, and parade) were stone gray, a brownish-gray color that was conspicuously different from the gray-green of the People's Police. Officers' uniforms differed from those of enlisted personnel by better quality and texture cloth. The field and service uniforms were normal attire for most day-to-day functions. Field Service Uniform (Felddienstuniform) - The summer field uniform for both officers and enlisted consisted of a jacket and trousers in a dark-brown (later a forest green) raindrop camouflage pattern on a stone-gray background; a field cap, service cap, or steel helmet; high black boots; and a leather belt with vertical web shoulder suspenders. In winter, a quilted stone gray padded suit without a camouflage pattern was worn over the service uniform. Later winter uniforms were also of the same camouflage pattern as the summer variant. The winter uniform also included a fur pile cap or a steel helmet, boots, knitted gray gloves, belt, and suspenders. Service Uniform (Dienstuniform) - The summer service uniform for officers was a bloused jacket worn without a shirt, trousers, and a visored service cap. The winter service uniform featured a jacket with four large buttoned-down patch pockets, a black waist belt, the service cap, breeches, shirt, tie, and pants belt; high boots were reserved for officers and NCOs. A long, heavy, belted greatcoat was also part of the winter uniform. Semi-Dress/Walking-Out Uniform (Ausgangsuniform) - With a few details, the semi-dress uniform was the same for all ranks and was worn for walking-out purposes (i.e. off-duty and off-post). It consisted of a single-breasted tunic without belt, a silver-gray shirt with dark-gray tie, the service cap, long trousers, and black low-quarter shoes. Officers also wore the tunic with a white shirt. During periods of warm weather, there was the option of omitting the tunic, and furthermore omitting the tie. A double-breasted jacket was optional for officers and warrant officers. Parade Uniform (Paradeuniform) - The parade uniform for officers was the semi-dress/walking-out tunic with all authorized orders, awards and decorations attached, breeches and riding boots, steel helmet, white shirt, dark-gray necktie, and a ceremonial dagger worn on the left side and fastened to a silver-gray parade belt. Officers in guards of honor carried sabers. In winter, a greatcoat, scarf, and gloves were worn. Work Uniform (Arbeitsuniform) - Seasonal considerations and weather governed the kind of work uniforms worn. Generally, reconditioned articles of service uniforms (field, semi-dress, and padded winter uniforms) were dyed black and issued for all types of fatigue and maintenance details. Coveralls are also used by the lower ranks, especially armor and air force personnel. Officers in technical branches supervising fatigue details wore a laboratory-style smock. Other Uniforms — High-ranking officers occasionally wore white uniforms (or white jackets), and staff officers were issued distinctive staff service uniforms. Women wore uniforms consisting of jackets, skirts or slacks, blouses, caps, boots or pumps, and other appropriate items according to season and occasion. Personnel such as paratroopers, motorcyclists, and tank troops wore additional items with their uniforms identifying them as such.